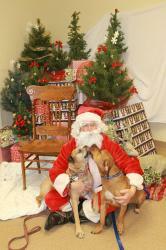 Santa will be visiting The Village Animal Clinic on Saturday. November 26th from 9am-12pm for our annual Pet Pictures with Santa! We will be collecting voluntary donations for a wonderful organization, Operation at Ease. Operation at Ease is a local rescue group that adopts dogs from shelters, pairs them with veterans in need, and trains them to become PTSD service dogs. Any amount, big or small, to help support their efforts would be greatly appreciated. The whole family to welcome to join in on the fun and no appointment is necessary. Our festive photographs make great Christmas cards and we will have holiday treats available for humans and pets.